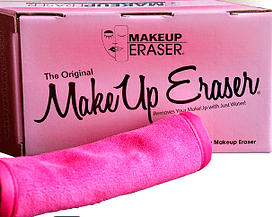 Enter a comment below and have a chance to win your very own Make Up Eraser!!!!!! Contest ends October 17th!!! We instruct everyone to wash the makeup eraser prior to use as with any clothing or product used on your skin. Washing instructions are on the tag. Wet a portion of the Makeup Eraser.Ensuring that it is soaking wet and then ring out a little so as not for it to drip. Use warm water. Take the short nap side and gently rub off the makeup in circular motion. Then flip the Eraser to the long nap side to exfoliate! Wash the Makeup Eraser as needed! Washing instructions on tag. Dryer & Dryer Sheet friendly!